The Association for Tropical Biology and Conservation recognizes the exceptional research of our students and early career scientists with awards for outstanding presentations at the Annual Meeting. The Luis F. Bacardi Award for Advances in Tropical Conservation is awarded to the individual receiving their Ph.D. no more than 5 years before the meeting date who gives the best oral presentation. This award was established in 2005 with an endowment from the Lubee Bat Conservancy, an international non-profit organization based in Gainesville, Florida. This organization was founded in 1989 by the late Luis F. Bacardi, and is dedicated to protecting biological diversity through the conservation of fruit- and nectar-feeding bats. The Alwyn Gentry Presentation Awards are in recognition of the outstanding oral and poster presentations by students at the annual meeting of the Association for Tropical Biology and Conservation. Alwyn Gentry’s legacy to tropical biology was not limited to the study of the diversity and conservation of tropical plants—he was a caring and supportive mentor to students from all over the Americas. These awards are in remembrance and recognition of the contributions of this singular scientist, colleague, mentor, and friend. We are honored by all who chose to present their work at the 2015 ATBC Meeting in Honolulu, Hawai’i, and congratulate the following recipients for their outstanding presentations. Does the island-wide loss of insectivorous birds initiate a trophic cascade? Haldre Rogers setting up exclosures on Pacific Islands. Insectivorous birds are common top predators around the world, yet studies of their trophic impact have produced equivocal results, leaving open the debate about whether birds drive terrestrial trophic cascades. In part, this may be because nearly all studies of bird-driven trophic cascades come from small-scale exclosures, and we lack an example that demonstrates the impact of insectivorous birds across a landscape. 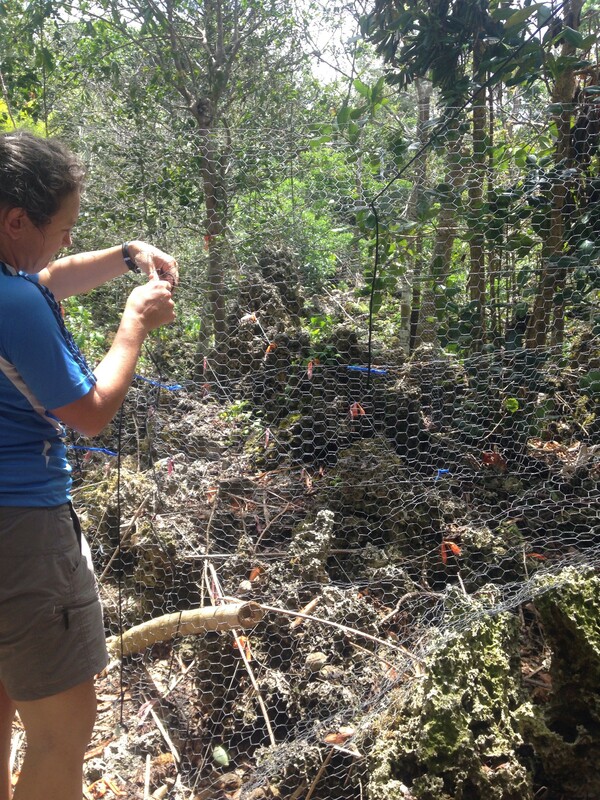 Here, we take advantage of a unique situation, the loss of all forest birds from the island of Guam caused by the introduction of the invasive brown tree snake, to determine whether insectivorous birds exert top-down control on a forest food web. Three nearby islands (Rota, Tinian and Saipan) have bird communities similar to those on Guam prior to the snake invasion, and thus serve as suitable controls. To supplement the inter-island comparison and isolate the role of birds, we set up bird exclosures with adjacent paired control areas on all islands. In each area, we planted seedlings from six common forest species and recorded survival after 5-10 months. On islands with birds, only one species survived better in the presence of birds than in the exclosure. In addition, seedlings of the same five species survived as well or better on Guam than on islands with birds. Collectively, our results do not support the presence of a strong three-level bird-driven trophic cascade affecting plants. However, we also found that there are significantly more spiders on Guam relative to islands with birds, likely due to release of top-down control by birds. We propose that birds exert strong control on large arthropods, including carnivores such as spiders, which may be able to compensate for the loss of birds and buffer the effects on lower trophic levels. In addition, the impact of birds may be context-dependent, such that the effect varies with species, abiotic conditions, and location within the forest; this would explain equivocal results from small-scale exclosure studies around the world. 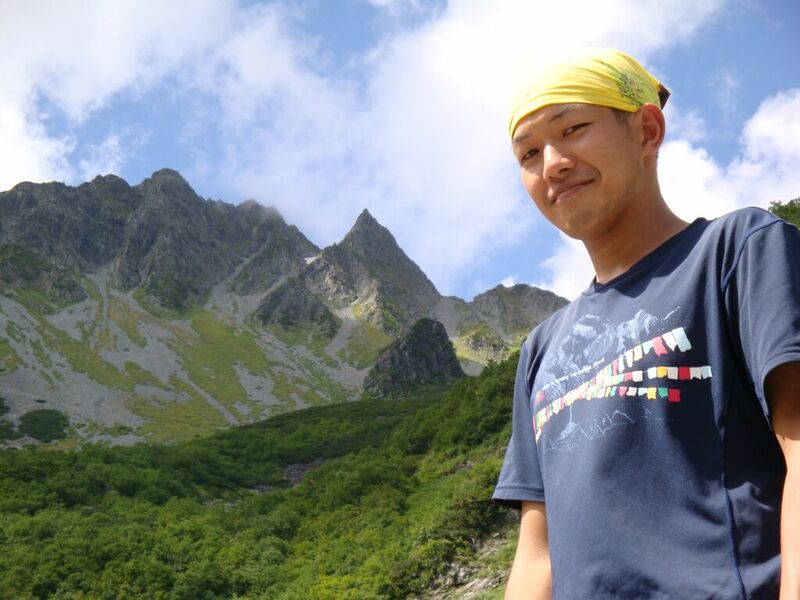 Gaku Amada, 2015 Gentry Award Winner for Best Poster (Photo by Tsutomu Miura). Metrosideros polymorpha, a dominant tree species in the Hawaiian Islands, shows extreme phenotypic variations. In particular, the variation of leaf trichome is remarkable. Glabrous leaves tend to be common at wet environments while pubescent leaves are more abundant at drier environments. There are also large variations in the amount of trichomes among coexisting individuals. Understanding adaptive significance of leaf trichome of M. polymorpha is thus important to understand diversification of this species in Hawaii. In this study, we explored adaptive significance of leaf trichome (1) among coexisting individuals at 1280m elevation and (2) among populations at three elevations (100 m, 1280 m, 2400 m) on the foot of Mauna Loa. In particular, we examined to what extent trichomes reduced transpirational water loss and increased water use efficiency, and whether the variations of the amount of trichomes were accompanied by variations of other leaf and shoot traits. Within population, the amount of trichomes varied from 0 to 76 g m-2. Reduction of the transpiration rate due to these trichomes was by 3% at most. Consequently water-use efficiency did not significantly differ between pubescent and glabrous individuals. However, pubescent individuals had greater nitrogen per area, a higher light-saturated photosynthetic rate and a smaller leaf area per shoot than glabrous individuals. Among populations, the average amount of trichomes was 132, 31 and 19 g m-2 for 2400, 1280 and 100-m population, respectively. Even on the leaves at 2400 m, which are most pubescent among the populations, trichomes accounted for only 8% of the total resistance for transpiration. Individuals at 2400 m had more nitrogen per area, a higher light-saturated photosynthetic rate and a smaller leaf area per shoot. In summary, direct contribution of trichomes to saving water may be small. However associated changes of other leaf and shoot traits together contribute to dry tolerance of M. polymorpha. How does habitat fragmentation affect disease susceptibility? Examining the relationships between geography, population genetics, and disease. 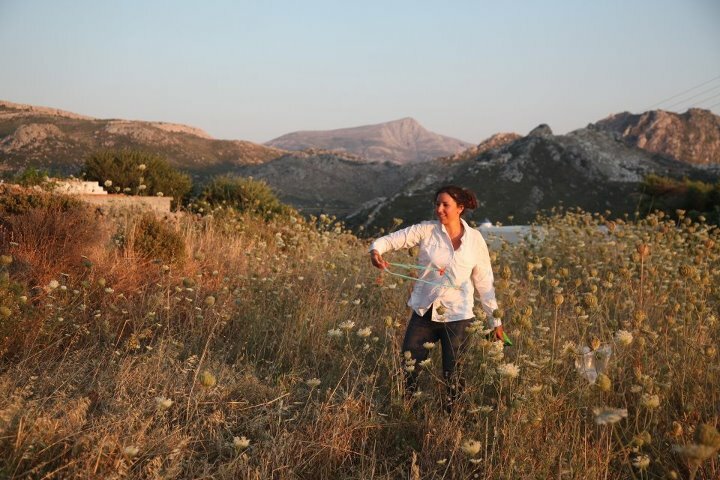 Anat Belasendoing fieldwork on Naxos Island, Greece. Human impacts on natural systems often promote disease emergence, but the ecological and evolutionary mechanisms by which this occurs are poorly understood. When humans divide and reduce natural areas (e.g., by building roads or creating agricultural land), a process known as habitat fragmentation, the disjunct patches of forest that remain contain small, isolated wildlife populations. These populations can become inbred very rapidly. Inbreeding may in turn increase disease susceptibility, but empirical tests of this phenomenon are lacking. Land-bridge islands offer an interesting model system for habitat fragmentation, as they were naturally fragmented by rising sea levels due to glacial melting in the last 20,000 years. Populations remaining on these islands represent relicts of once contiguous populations, and thus provide insights into the long-term effects of fragmentation. In this study, I will examine whether disease susceptibility is affected by fragmentation history in amphibians, which are particularly vulnerable to both stressors. The study will be performed in an area that is extensively fragmented, contains hundreds of land-bridge islands, and is heavily invaded by disease agents: the Brazilian Atlantic Forest. I use genomics techniques to compare two ecologically different amphibian species across three macrohabitats: contiguous forest, human-created habitat fragments, and land-bridge islands, which respectively represent areas with no fragmentation, recent fragmentation, and historical (natural) fragmentation. Disease prevalence and infection load of amphibian hosts are also quantified using molecular techniques. The results of this study will not only provide information about the frog populations surviving in the endangered Brazilian Atlantic Forest and on the understudied islands of the region, but also will provide insights for managing fragmented populations. 2015 Gentry Award Winner Sarah Jane Wilson and the Santa Lucia Cloud Forest Reserve’s Jorge Noe Morales in the Ecuadorian Andes (Photo by Jake Brennan). Andean forests were cleared at a rate of 1% per year in the past decade, mainly for farming. But forests also returned in some locales, producing ‘forest transitions’ – net increases in forest cover. Seen as a silver-bullet solution to conserve biodiversity and provide residents with the ecosystem services that sustain small-scale farming, the drivers of local transitions are still little studied. I examine forest cover change in Intag, an Andean ‘biodiversity hotspot’ where people are planting trees to restore cloud forest. I ask: do communities reforest and deforest simultaneously? Which households reforest, why, and how do they benefit? Remote sensing shows that prior to reforestation projects (1991-2001), deforestation rates in Intag were extremely high (>3%/year). During reforestation (2001-2010), forest cover increased by 3% – a local forest transition. However, although deforestation rates slowed precipitously (<2%/year), people continued clearing biodiverse primary forests in the highlands even as they reforested farms and communities. Household interviews and oral histories point to a new ‘path’ by which forest transitions occur – the ecosystem scarcity path – in which local demand for forest ecosystem services drive forest recovery. Because people continued to clear biodiverse primary forests, species continued to be lost. However, replanted areas also contained far more tree species than unplanted, abandoned pastures. Communities experiencing environmental crisis may be most in need of, and thus willing to participate in, local tree-planting efforts. Ecologically, these degraded environments are also most in need of restoring – a win-win for forests and people in heavily cleared regions throughout the tropics. ← Editor’s Choice @Biotropica 47(4): Do bats fertilize their roost trees?